We are head over heels in love with our Hello Sunshine range! The sunscreen glides on smoothly but is thick enough to stay on for protection. The Facestick is small enough for kids to take to school and keep in their school bags and apply themselves. Also great for the family! 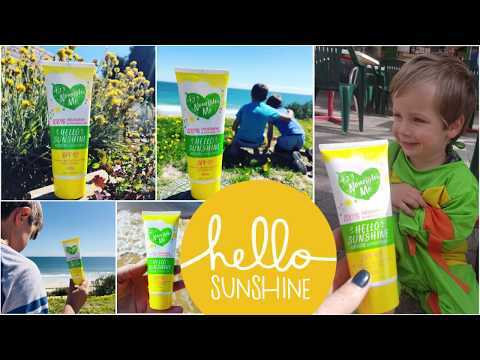 Hello Sunshine is free from all synthetic preservatives and parabens. Natural, safe and smells delicious! Zinc Oxide 210mg/g (and) Coco-Caprylate/Caproate (derived from Coconut Oil) (and) Polyglyceryl-3 Polyricinoleate (Vegetable Based Emulsifier) (and) Isostearic Acid (Fatty Acid), Caprylic Capric Triglyceride (derived from Coconut Oil), Beeswax, Ricinus Communis (Castor) Seed Oil, Cocos Nucifera (Coconut) Oil, Tocopherol (Vitamin E), Vanilla Flavour. The Good Stuff in Hello Sunshine! Beeswax is a beautiful an natural wax made by bees that gives hello sunscreen its water resistance. Fractionated coconut oil, also called “liquid coconut oil,” is a form of the oil that has had the long-chain fatty acids removed. Just this one change makes the oil liquid at room temperature, and extends our sunscreen’s product’s shelf life while providing added protection. We use a food grade natural vanilla which is made from vanilla beans soaked in alcohol. This gives our sunscreen a very subtle sweet scent. Does this sunscreen stain clothes? Is your sunscreen nano or non nano? Is your sunscreen water resistant? What age can I use hello sunshine from? There is some scientific evidence that oxybenzone, a sunscreen active, could be contributing to coral bleaching. We don’t and will never use oxybenzone in any of our products. 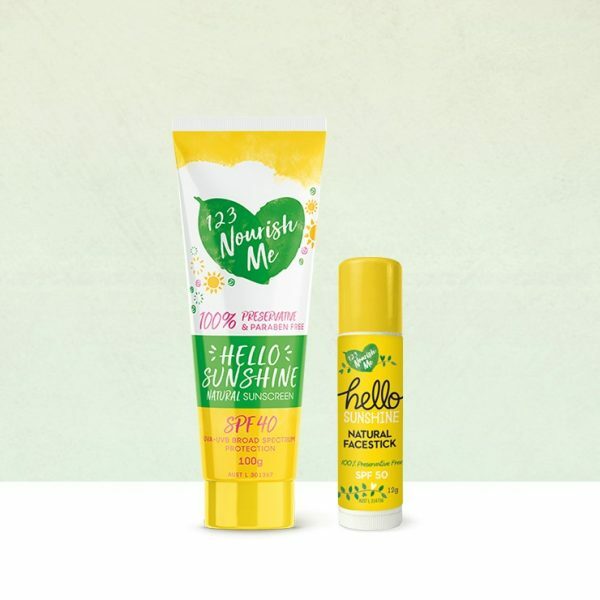 Does Hello Sunshine contain any synthetic fragrance? No. Our sunscreen and sunstick smells delicious because we use an actual food grade vanilla. We chose not to use any synthetic fragrance within our products and we’ve chosen to use something that is so safe it’s actually edible! (Although we do not recommend eating our sunscreen to find out!) Our sunscreen has a very mild, sweet scent and both kids and adults give it 2 thumbs up. The sunscreen is great. I love knowing it is free from nasty chemicals and safe for my family. No greasy residue and it rubs in easily. My son gets eczema and I haven’t had any trouble with his skin while using this! Love this sunscreen, it’s the only one that doesn’t irritate mine and my kids sensitive skin. Added bonus that it is natural and smells divine! We purchased this sunscreen on the high recommendation of a lot of other parents. Having all natural ingredients is really important to us and this sunscreen is all natural and does the job of protecting our baby’s skin when outside! The cream is not too oily like some other natural creams, we love it! This “Hello Sunshine” sunscreen is excellent. 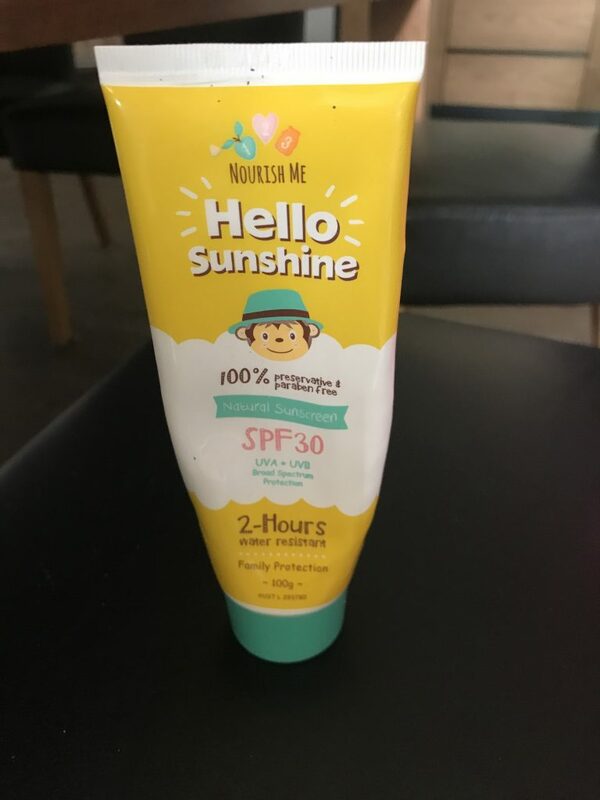 My three boys are allergic to all the sunscreens out there and this Hello Sunshine is the only one that doesn’t make their skin break out in a hot red itchy rash. This amazing product is a godsend in my eyes, also my boys love and have commented on how nice it smells therefore no more complaining-winning!! This product does not disappoint and I highly recommend this product to everyone I meet. Thank you 123 Nourish Me for making my life easy and happy. Love the Sunscreen so much! I have always been a zinc fan but found them a little thick (so did my husband with facial hair ha ha!). Now our whole family of 5 has natural protection that allows us to enjoy the beach without harmful chemicals yeah!!! Love this sunscreen!! Easy to apply, great smell and most importantly actually works! If you could sell it in a big container – that would even better. Amazing product! Tried so many suncreams on by 18month old and this is the only one that doesn’t dry out his skin. Smells great too! Thank you! Hands down THE BEST natural sunscreen we’ve ever used….and I’ve tried most of them! Its light, smells great and easy to apply where most others are thick and dry my boys sensitive skin out. His skin actually feels moisturised after using this. I would just like it in a giant tub now! This is our forever sunscreen. Brilliant, non greasy and so gentle on our super sensitive skin. Finally a sunscreen that actually smells great and works. Kids couldn’t be happier. I have tried many natural sunscreens and this is the best by far. It is not drying and does not have that white ghost affect on the skin. Rubs in easily and smells great. Smells gorgeous, rubs in clear, nice and thick so great coverage. The suncream is amazing, it’s hydrating, doesn’t leave a white film on your face and protects without the nasty ingredients. I love it and highly recommend it to everyone. I can finally say… My son is no longer allergic to suncreen with this beauty! I can recommend to anyone with sensitive, rash prone skin to give it a try! We did and you never know it might just work for you and your family too! Money well spent! Excellent product, I’ve tried a few different natural sunscreens but this one is by far the best, it goes on easy, doesn’t leave white marks or leave a greasy feeling. Lovely product and easy for kids to apply without needing my assistance unlike previous sunscreen we were using. Hands down the best low tox sunscreen I’ve come across (and I’ve tried lots!). This smells great and doesn’t make my skin go white. I love how my face feels nice and moisturised when I apply this, and so far no breakouts which I sometimes get when I wear sunscreen on my face. No complaints from hubby or the kids either! Finally something that is not nasty and the kids can apply themselves! My 6 &8yr old have their own in their lunch bags so they can reapply as needed. It is also smells lovely which is an added bonus! Hands down the best natural sunscreen I have tried!!! And I have tried a few I won’t buy anything else now! My children actually enjoy getting sunscreen put on as it glides on so nice and smells amazing! I don’t even mind putting it on my face as it feels so good! Best we’ve tried so far. Smells amazing. Will be reordering soon! Love love love this sunscreen! Used it all last summer for the whole family, and have just restocked for this year. . So good to find something safe to put on our sensitive skin – and it actually rubs in! Hands down the best sunscreen I have ever used!My kids actually let me put this one on them,it rubs in and is not greasy,doesnt bead with sweat like other natural sunscreens and leaves no ghostly appearance.The smell is divine,i will not buy a different sunscreen to this one. Without a doubt the BEST sunscreen on the market! So lovely to put on and no troubles at all on sensitive skin. Love this sunscreen. I don’t want to apply chemicals onto my skin so wanted a natural sunscreen wich provides protection from the sun. This one is excellent. My daughters skin has been exceptionally sensitive since her birth and she is three years old now. We can’t use anything on her except for filtered water. You can imagine how hard it’s been to find sunscreen. This one is perfect. She loves it and so do it. Five stars. great product. My daughters sensitive skins loves it. Love the smell and texture of this product. However it does take a while to apply as is quite thick. The roll on works well. Great for schoolbag. Have tried a few natural sunscreens and the smell of most put me off. This one is great and also a thick consistency but easy to apply. Love the smell and so easy to apply. The mos important thing my kids are not allergic to it like most sunscreens on the market. Staple suncream in our house now. Easy to apply and it works! I love this sunscreen, easy to apply, smells great and the dirt and sand don’t stick to my toddler like some other natural sunscreens. Best of all, no reaction from my eczema child. Love it, smells amazing and say to rub in. Wonderful stuff. Smells great, not thick and gluggy like other crap free sunscreens, Plus a little goes a long way. We live on a farm & our little girl loves the outdoors. She has very sensitive skin & burns easily, we have tried so many sunscreens that have caused rash & irritation but not this one! Wow! Cannot highly recommend this sunscreen enough! We won’t be using anything else. It goes on so easily & smells delicious! She loves putting it on & just knowing that it has no nasties, is all natural & safe to use is a big plus for us too. Well done 123 Nourish me for looking after our kids! Absolutely love this suncream!! Rubs in so easily, smells amazing & the ingredients aren’t harmful for my precious family! Winning!! Love this sunscreen. It’s natural & finally the natural sunscreen that actually smells very nice too! Repeat customer over here. This is hands down the best natural/organic sunscreen we’ve used. It smells amazing, my kids do not break out in a rash or eczema and it goes on great and doesn’t leave them greasy! Will never use anything else! Love how it’s not bad for our ocean friends either! Thank you! Love this sunscreen. It is one I have used that doesn’t leave a white colour on your skin. Plus being so natural. Love it!!! We are looking forward to using this sunscreen more as the weather warms up. My 11 year old gets rashes from other sunscreens but not with Hello Sunscreen! So glad to have found a natural sunscreen that rubs in so easily. Thanks! I’ve been searching for a no-nasties sunscreen that is safe to apply every day before school without causing irrational to their sensitive skin, and that my children will actually allow me to put on them, and I’ve finally found it!! Every sunscreen we have tried with our youngest he has ended up with a rash everywhere. Put the Hello Sunshine sunscreen on him the other day and no rash. Very happy! Recently purchased for my children to have at school. They have to apply sunscreen at playtime, I’ve always used natural ones, however this is the best by far!! Kids love it. We are looking forward to trying more of your products. fantastic product and smells great! cannot wait to get the rest of the products and start elimanting the other nasties from our home. highly recommended! Love it – goes on easy. Mr 5 loves the smell and best of all it passed the nippers test this morning. All four of us in the sun for 2 1/2 hours with no red bits to be seen. Just wish it came in a larger container. After a recent trip to Bali, this baby is all gone! Smells great and really works! Perhaps most importantly is the additional peace of mind that the sunscreen is not laden with nasty (cancer causing) chemicals. I have ordered a replacement tube but wish it came in a bigger size to get us through the WA summer! Can’t thank you enough for this product! It’s amazing and doesn’t even compare with other brands I have tried. This sunscreen smells great and rubs in really well. Also gives good protection when used as directed. We are going to Greece next week so that’ll be the ultimate test. I’m sure it’ll perform beautifully!